Explanation: How did the star Eta Carinae create this unusual nebula? No one knows for sure. 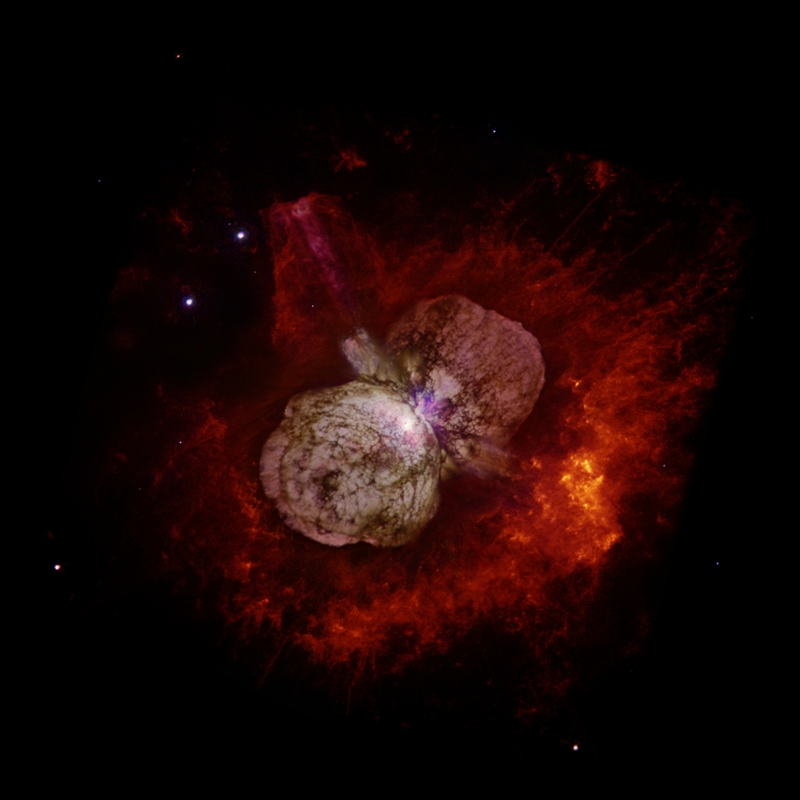 About 165 years ago, the southern star Eta Carinae mysteriously became the second brightest star in the night sky. In 20 years, after ejecting more mass than our Sun, Eta Car unexpected faded. This outburst appears to have created the Homunculus Nebula, pictured above in a composite image from the Hubble Space Telescope taken last decade. Visible in the above image center is purple-tinted light reflected from the violent star Eta Carinae itself. Surrounding this star are expanding lobes of gas laced with filaments of dark dust. Jets bisect the lobes emanating from the central star. Surrounding these lobes are red-tinted debris captured only by its glow in a narrow band of red light. This debris is expanding most quickly of all, and includes streaming whiskers and bow shocks caused by collisions with previously existing material. Eta Car still undergoes unexpected outbursts, and its high mass and volatility make it a candidate to explode in a spectacular supernova sometime in the next few million years.